Phase One and Leaf-Mamiya Official User to User Forum • View topic - How to name a file in Capture One 9.2.1? How to name a file in Capture One 9.2.1? I am having a hard at finding how to name files in Capture One. I take portrait pictures of participants, with each of them having an 3-digit identifier. Basically, what I would like to do is to enter somewhere in Capture One the 3-digit identifier of the next participant (say 076), then take the pictures on a specific date (say 28 April 2017) and then have the file names such as Database_076_20170428_00001, Database_076_20170428_00002, Database_076_20170428_00003 and so on. At the moment, I can only manage to get Database__20170428_00001, Database__20170428_00002, Database__20170428_00003 and so on, without understanding how to include the 076! 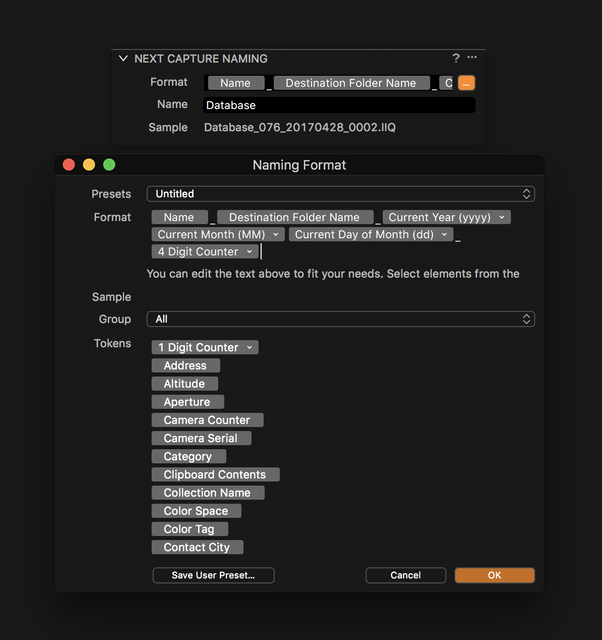 Re: How to name a file in Capture One 9.2.1? I usually accomplish this type of naming by using the Destination Folder Name token, and then creating subfolders in the capture folder named by the shot identifier. When the folder is set as the capture/import folder, the shot names will inherit the identifier from the folder name. I'm not exactly sure what you mean by the "databsase" tag, but depending on which token you're using to populate that field, if you don't want to use subfolders for each shot and aren't populating the "database" infor from the Job Name/Name token, another option would be to simply use the "name" token and change the name field in Next Capture Naming tool before each shot. I will try it out next Tuesday and let you know. I could not manage with the folder name stuff, but your hint on changing the name did the trick: I just need to change this field with the corresponding participant number and it works for me!